LIFE CYCLE: Aimee Ross returned to her childhood love of cycling when she headed west after college. As Aimee got older, the bicycle faded out of her life. She remained enamored with the outdoors, but she seldom cycled, until late in college. After college, Aimee wasn’t sure what she wanted to do, so she headed west with a friend. They landed in San Diego, where she scored a job as a sales assistant with Ellsworth Cycles. It was during her stint at Ellsworth that Aimee got her first taste of real mountain biking in the red rock deserts of Moab, Utah. She was hooked, and she progressed at Ellsworth at breakneck speed, eventually rising to the rank of operations director. She also carved out time to spearhead socially conscious projects that aligned with her passions, such as Project Pink, an initiative geared toward getting women interested in cycling while raising money for breast and ovarian cancer research. The two started dating, and Nat asked Aimee to marry him the following year. Soon after, the pair moved from California to the little town of Basalt, Colo., just down the valley from Aspen. During their time in Colorado, Aimee and Nat started a NICA high school mountain biking team in Aspen and Aimee blazed a new path in her career doing government relations and advocacy work for the International Mountain Bicycling Association. In this capacity, Aimee made her way to the Ozarks for the first time to help plan the IMBA World Summit in Bentonville in 2016. It would prove to be yet another turning point in Aimee’s life. During the planning process, Aimee worked closely with Kalene Griffith, director of Visit Bentonville, the city’s destination marketing organization. In fact, one of those women came back and stayed: Last October, Aimee joined the Visit Bentonville team as director of Bike Bentonville, an arm of the parent organization committed to “branding, promoting, and selling Bentonville as a cycling destination. That forward-thinking, outward focus is what makes Aimee’s take on what might otherwise be a traditional tourism marketing job so unique and refreshing. She thinks far beyond Bentonville’s city limits to consider her adopted home’s potential impact on the nation as a whole, especially its countless small towns. Aimee wants folks to come to Bentonville and leave inspired about what they can do to make their communities thrive. Where she rides - In keeping with Aimee’s can-do (-it-all) attitude, it’s impossible for her to pick a favorite local trail: “There is so much trail that is so good, whether it’s a technical or leisurely climb or a super flowy or rocky descent.” Nevertheless, there are a few standouts: “I love Coler Mountain Bike Preserve for the descents, whether it’s Cease and Desist (minus Drop the Hammer) or Rock Solid. They are both so different but honestly they’re the most fun downhill runs in the city. 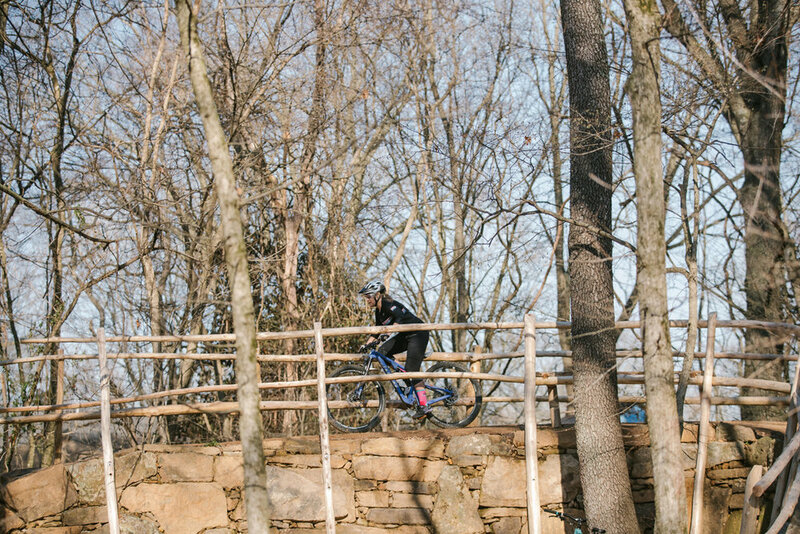 For climbing or an all-around trail, I really love Tatamagouche (because I love the name) and Medusa at Slaughter Pen.” You can find Aimee shredding these and other trails throughout Northwest Arkansas on her purple Juliana mountain bike (she’s an ambassador for the brand). Indeed, partnerships are at the heart of Aimee’s work in Bentonville. 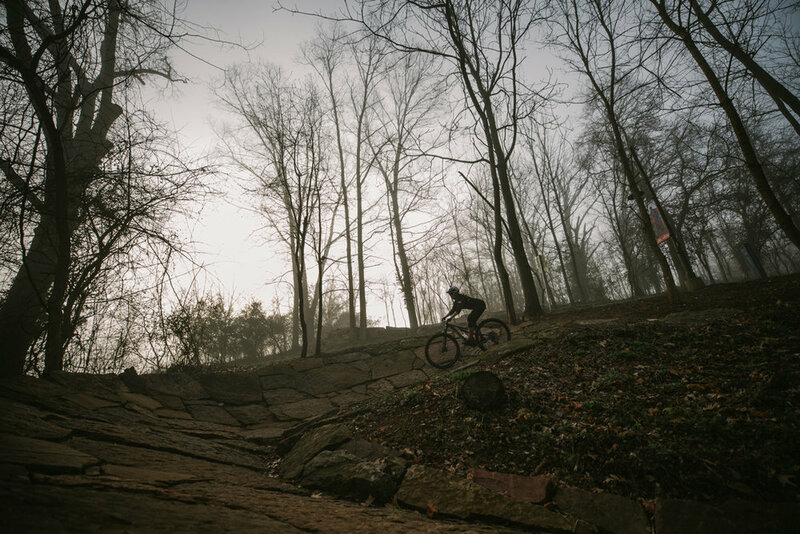 “Because cycling is growing so fast in the region” — more than 90,000 mountain bikers visited Northwest Arkansas between summer 2017 and summer 2018 — “we will need to continue to learn from one another and collaborate to make us a strong cycling hub. Our success comes from collaboration, listening and continued education. This effort needs to be evergreen. … As development happens, the need to create connectivity is going to need to be intentional.” And that theme of connectivity applies to more than just physical links between the area’s 400 miles (and counting) of mountain biking trails, paved trails and on-street bike infrastructure — it also applies to the relationships and opportunities that these amenities foster. In the same way that bikes have stitched the pedal-themed patchwork of Aimee’s life together, so too, Aimee believes, bikes can connect and strengthen Bentonville as it transforms over the years.